The Collab Blog: Telling our Stories . . . The Power of Blogging with Students! Telling our Stories . . . The Power of Blogging with Students! The other day I was checking my Tweetdeck columns and I came across a couple of my favorite tweets of the week from my colleague Dean Burrier Sanchis. 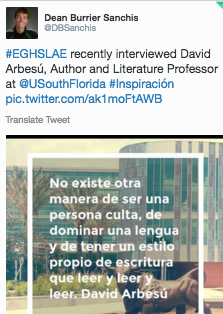 The tweets share the interview his AP Spanish Literature students did with Literature professor and author David Arbesú. A couple of things stood out to me. First I thought, what a great activity for students to apply their learning in such a meaningful experience, interviewing the professor who had translated from Spanish to English the work of literature they had just read in class; a great example of extending learning beyond the classroom walls! I also thought how great it was that they shared their experience with their blog post. I wonder if the students even realize the impact of their interview and blog post on their readers. As I read the post, I learned from and was inspired by their experience. They inspired me to re-read the works that were cited in the interview! Their post reminded me of the power of sharing our stories with others. When we write, we learn more deeply from our own reflection, and we inspire learning in others, multiplying learning opportunities, especially when we write for an authentic audience; a live, and potentially world-wide, audience! Furthermore, the class blog is a great way to share with parents and the community to give them a glimpse of what learning looks like with our students. Here is the link to their blog post. Check it out! 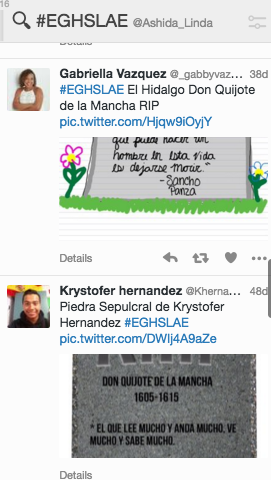 Even if you cannot read Spanish, you can appreciate and be inspired by their work. You will notice that all of the students participated in the interview, they shared a transcript of the interview, and, together in collaboration with their teacher, they are all listed as authors on their class blog. Check out the archives of their blog, too, to see earlier posts by these student authors. Consider leaving them a comment on their posts. Think how excited the students would be to hear from their readers! 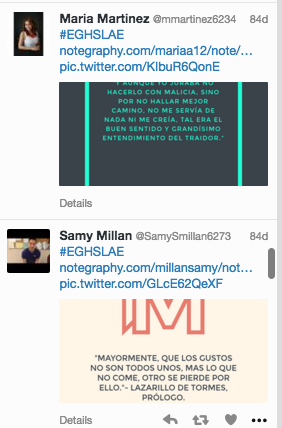 In addition to blogging, the class also uses Twitter, as a microblog, with their class hashtag #EGHSLAE to share their learning experiences. Check that out too! 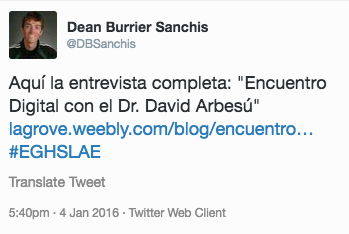 Perhaps the work of Dean Burrier Sanchis' students will inspire you to consider blogging with your own students. And if you do, please share with us! We'd love to learn from your examples too! If you are interested in getting started, please check in with us at the Collab Lab! We'd be happy to help. Thank you for mentioning my blog post! I'm happy to see others compelled to advocate for providing an authentic audience for students. In case you haven't noticed, video games have taken over the world! These action packed adventures have quickly become the favorite past-times of kids from 3 to 83 and there is not let up in sight. If you haven't yet realized your full gaming capacity, check out the following article for some amazing tips.